If an admin wishes to "close" or "open" their form from entry by users, there are a number of methods to do this. If an administrator wants to "close" their form and configure the form so no users can access or make new entries to their form, please follow steps listed below. There are a number of ways to accomplish this and assure that no user can enter a new submission to the given form based on how the form is configured and how the administrators wishes to "close" the form. Those options for "closing" the form are listed in this document. It is up to the administrator to determine how they wish to "close" their forms. NOTE: This document has instructions and screenshots relevant to Inactivating or Closing a given form. If you are wanting to Activate or Open a form, do the opposite of the instructions list below. 1. The first option to close the form is to Inactivate the form through Edit Form Properties. 1a. From the form dashboard, navigate to Edit Form Properties. 1b. Inactivate the form by toggling off the Active checkbox to inactivate the form. 1c. By inactivating the form, the user will receive a "No Forms Available" message when they try to access the form URL. 2. The second option to make the form inaccessible to users, is to close the current period through editing Periods. 2a. From the form dashboard, navigate to Periods. 2b. Select Edit on the given period in question. 2c. Once Edit Period pops up...change the End Date of the Current Period to a date in the past. 2d. By setting the current period date to a date in the past...the user will receive a "No Forms Available" message when they try to access the form URL. 3. The third option if your form is constructed with sessions, is to establish an end date in the past for all sessions. This would allow the user to enter the form, but if all of the sessions are "closed", they will be unable to select a session to register. The event session Registration End Dates can be set ahead of time to automatically close the sessions on a certain date, once that date arrives. 3a. From the form dashboard, navigate to Periods. 3b. Click Edit Event Sessions for the given period. 3c. Click Edit on the given event session to bring up the editing pop up. 3d. 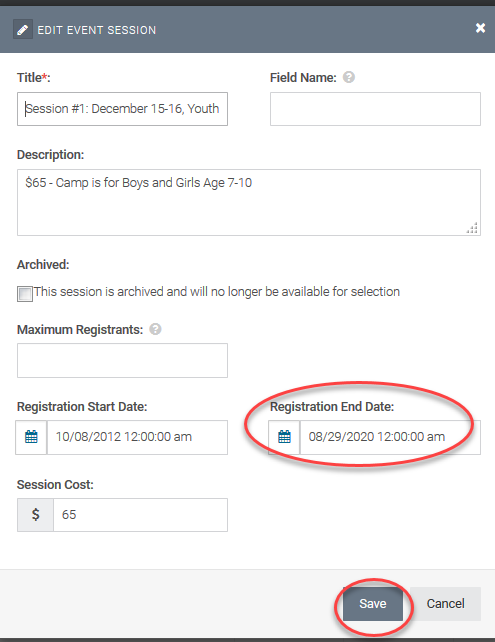 Once inside the editing window for a particular event session, edit the Registration End Date to be in the past to close the session and select Save. 3e. Edit all event session Registration End Dates to be in the past to close all sessions. 3f. Once all sessions have been closed, the user will still be able to access the form, however, they will be unable to select a session and continue because the session are now closed.